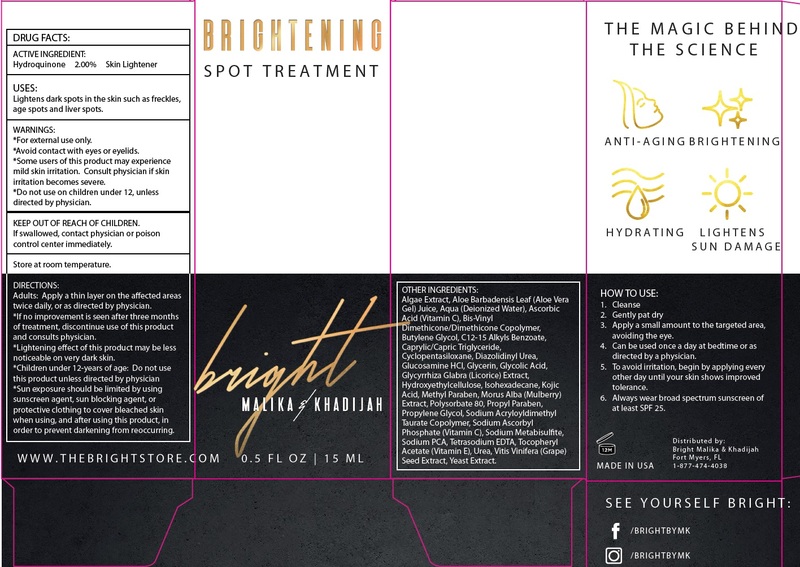 Proprietary Name: Bright Malika And Khadija Brightening Spot Treatment What is the Proprietary Name? Non-Proprietary Name: Hydroquinone What is the Non-Proprietary Name? Bright Malika And Khadija Brightening Spot Treatment with NDC 71177-008 is a a human over the counter drug product labeled by Pulsaderm, Llc. The generic name of Bright Malika And Khadija Brightening Spot Treatment is hydroquinone. The product's dosage form is cream and is administered via topical form. FDA Application Number: part358A What is the FDA Application Number? Lightens dark spots in the skin such as freckles, age spots and liver spots. *Avoid contact with eyes or eyelids. *Some users of this product may experience mild skin irritation. Consult physician if skin irritation becomes severe. Children under 12, unless directed by physician. If swallowed, contact physician or poison control center immediately. Adults: Apply a thin layer on the affected areas twice daily, or as directed by physician.If no improvement is seen after three months of treatment, discontinue use of this product and consults physician.Lightening effect of this product may be less noticeable on very dark skin.Children under 12-years of age: Do not use this product unless directed by physician Sun exposure should be limited by using sunscreen agent, sun blocking agent, or protective clothing to cover bleached skin when using, and after using this product, in order to prevent darkening from reoccurring. Sodium PCA, Tetrasodium EDTA, Tocopheryl Acetate (Vitamin E), Urea, Vitis Vinifera (Grape) Seed Extract, Yeast Extract.